MORE than a million people have taken part in a worldwide protest campaigning for greater gun control in America. 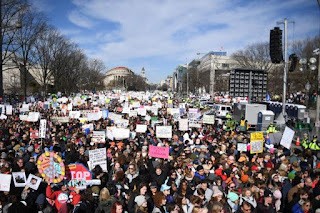 More than 800 events took place across the world, rallying in support of the student-led March for Our Lives mass movement. They are campaigning for tighter gun control laws following the February shooting at Marjory Stoneman Douglas High School in Parkland, Florida where17 students and staff members were killed. 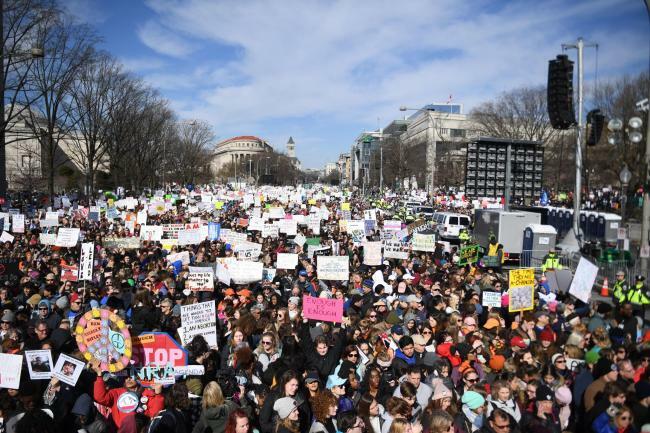 Stoneman Douglas survivors lead the main event in Washington DC, with an estimated number of 800,000 in attendance, making it the largest protest since last year's women's march. Student Emma Gonzalez, who drew headlines for her impassioned speech following the Florida shooting, read the names of her fellow students. She then stood in silence for six minutes before telling the crowd this was the length of time of the gunman's spree. She then ended her speech saying "fight for your life before it’s somebody else’s job". Other marches also took part across the States and the world, including in Los Angeles where stars and survivors of the shooting spoke in support of the mass movement. They carried placards reading "Bullets are not school supplies", "My congressman takes NRA blood money" and "Protect kids not guns". A White House statement read: “We applaud the many courageous young Americans exercising their first amendment rights today". Trump later tweeted support for “the victims of the horrible attack in France yesterday” but did not mention the gun control rallies on Twitter. RELATIVES of the victims of the Dunblane massacre also lent their support to the worldwide March for Our Lives protest campaigning for greater gun control in America. Hundreds of people protested outside the US Consulate in Edinburgh, which was supported by the Dunblane No Guns movement. Speakers at the Edinburgh rally included Jack and Ellie Crozier, whose sister Emma was killed in the Dunblane shooting, and Ali Ross, whose sister Joanna also died. They read a letter of support to those affected by the Parkland tragedy. The letter, first published on the 22nd anniversary of the Dunblane shooting, stated: "Wherever you march, whenever you protest, however you campaign for a more sensible approach to gun ownership, we will be there with you in spirit." Catherine Wilson, who lost her sister Mhairi in Dunblane, also took part in the event, reading her poem For Parkland/The Public I. She said: "I think we are at a breaking point, I think we're at the point where the generation that I am part of now and the younger generation who are at school... have seen so many school shootings in their lifetime. "They have continually grown up in the shadow of school shootings, and they are the point where they just cannot take it any more." Several hundred people also gathered outside the US embassy in London. While the Dunblane shooting led to the UK enforcing some of the strictest firearms legislation in the world, the US gun lobby has resisted change. Earlier this month, survivors and relatives of those affected by the Dunblane shooting - where 16 children and a teacher were killed - sent a video message of support to the Parkland students.